We’re lucky to live in a world where travel is more accessible and enjoyable than ever before. In modern times, thanks to technological advancements, it’s easier than ever to fly all around the globe, visiting exciting new locations and experiencing new cultures. One of the best ways to really make the most of any trip is to stay in a hostel. These communal accommodation locations bring lots of people together in one friendly, welcoming environment, encouraging everyone to share their thoughts, ideas, experiences, advice, and stories. Staying in a hostel can quite literally be a life-changing experience, and it’s also a super way to save and enjoy the same great comforts you’d find in a hotel for a fraction of the cost. Many major cities around the United States are filled with hostels, with New Orleans being no exception. This Louisiana city is a wonderful place to visit, and a big part of New Orleans culture is the idea of people talking to each other, sharing ideas and exchanging cultures. It was that kind of behavior that helped to found the city in the first place and give it its distinctive Creole culture. 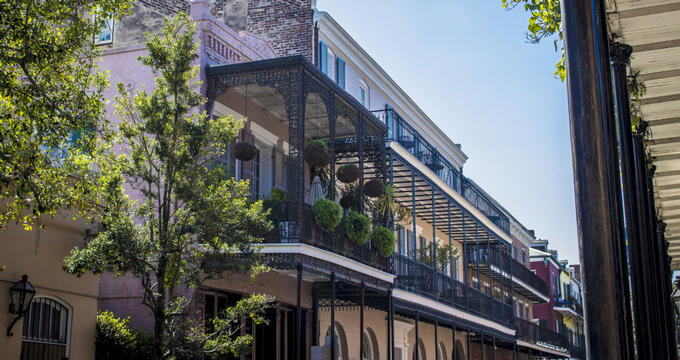 New Orleans is a melting pot of ideas and influences, and you can be a part of that too by booking a hostel in this city for your Louisiana adventures. Perfectly situated right in the French Quarter in the cultural heart of the city, this New Orleans hostel offers an authentic experience that you won't want to miss out on. City House Hostel attracts an eclectic, vibrant crowd of travelers. There's always something going on and someone new to meet at this location, with special events like happy hours and social gatherings designed to help people make friends and have fun. This is one of the top hostels in New Orleans and the multi-lingual staff will provide a warm welcome to all visitors. A bar is located on-site and free shuttles run to and from the airport. Deluxe and Superior rooms can be booked, as well as simple mixed gender dorms with up to 12 beds. Located in a beautiful modern-style building in the Lower Garden District, this classy hostel is a real step above most of the competition. With a relaxed atmosphere and a nice location right by a streetcar stop, The Quisby has proven to be one of New Orleans' most popular hostels. It's quite close to the French Quarter and all rooms come with private bathrooms. Full Wi-Fi is offered for all guests and tablets are also handed out for free usage as well. Room options include budget doubles, quadruples, female-only dorms, and mixed gender dorms with a maximum of six beds. Located in a quaint little residential area, India House Hostel is right by streetcar stops that will transport you quickly and easily to the livelier locations around the city. The front-desk is manned around-the-clock and a fully-equipped kitchen provides all you and your friends need to have a great time. The on-site courtyard and outdoor pool are great areas to get together with other guests and have some fun, and various live entertainment shows and events are held at this location on a regular basis. India House Hostel also has exceptionally low rates, so it's a super spot for budget-conscious travelers in New Orleans. Just a short walk from the St Charles at Euterpe streetcar stop and the Greyhound Bus Station, the Auberge NOLA Hostel is housed in a lovely old building with lots of international flags hanging right outside. With full Wi-Fi access and great attractions nearby like the World War II Museum, this hostel is another great option for your New Orleans stay. The lounge is comfortable and a great place to hang out, and there's also a games room for people who want to challenge their pals and organize little tournaments among other travelers.